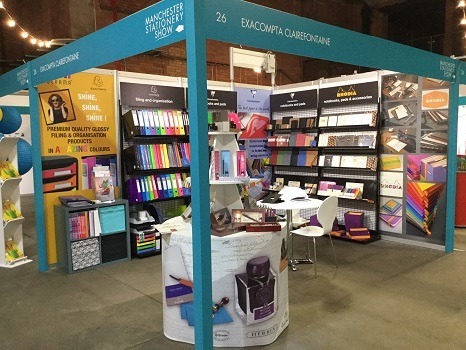 ExaClair, the UK supplier of Rhodia, J Herbin, G Lalo, Brause, Exacompta and Clairefontaine, has heralded the first-ever Manchester Stationery Show as a success with higher than expected visitor numbers, and positive interest particularly in its premium notebook and calligraphy brands. Taking centre stage were ExaClair’s calligraphy brands, including G Lalo, Brause and a new ink launching J Herbin’s re-brand. Aimed at the top end of the calligraphy market, the show was an opportunity for ExaClair to demonstrate the Jacques Herbin 1798 Améthyste De L’Oural ink’s premium quality manufacture, packaging and writing results. Another popular range was Rhodia’s line up of boutique, premium-quality notepads, books and desktop accessories, with the new Heritage range attracting considerable attention. The special edition collection celebrates the brand’s retro, French industrial design origins. “Our Iderama range from Exacompta was also very well received as we were able to show, using colour blocking, how filing can be displayed in an attractive way that was in keeping with the show’s ‘where fashion meets function’ ethos,” Clement concludes.